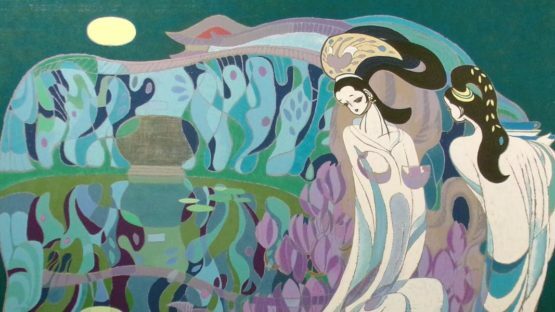 Renowned for his mystical motifs and fascinating control over colors and composition, He Neng is a Chinese artist who has been present and active on his country’s art scene for decades. Ever since he made the decisive move to this university, Neng was automatically associated with the Yunnan Art School and is considered to be one of the founding fathers behind this prestigious institution. As this artist is often identified with his school, it is often said that He Neng encapsulates the Yunnan style in his paintings, skilfully balancing between traditional and modern Chinese artistic motifs and elements. No matter what the particular subject of the piece is, He Neng always reflects China’s mythical past in one way or another. During the year of 1942, He Neng was born in a southwestern Chinese province of Sichuan, a region renowned for its cuisine and endangered giant pandas. Ever since he was a small toddler, He Nang was showing artistic tendencies and stories about creative potential and promise soon started to surround the young boy. After he graduating from the Sichuan Academy of Fine Arts in the year of 1965, He Neng was drafted and stationed in the city of Kunming, the modern capital town of China’s southern Yunnan province – here, the aspiring artist was in charge of producing political propaganda during the years of Mao’s Cultural Revolution that was taking place during the mid 1960s. Although these kinds of work were not something He Neng desired to do, it was still a lot better and safer than other vacations amidst the Chinese army, plus the experiences he gathered whilst producing political propaganda actually served the artist good in a long term. Slowly but surely, He Neng started to build a reputation for himself and soon his works were desired by many interested viewers – he went on to win prizes for his illustrations and ultimately, he joined the faculty of the Yunnan Art Institute where he is still serving as a professor to this very day. The Yunnan Art Institute started to be a lot more respected and influential as Neng joined their program – his works almost single-handedly resulted in a wider recognition of the Yunnan School. Neng seemed to be a perfect fit with the faculty that hired him as the style in his paintings was a fascinating mixture of traditional and modern Chinese elements – something that Yunnan Art School held in high regard. He has also displayed a strong control over coloring as he often uses a rich color technique that also became a particular hallmark of the Yunnan School. Neng is also one of the artists that believe improvisation, impulsivness and expression are all good aspects when making art, explaining it this way: I let the brush strokes follow the fluctuation of my thought and emotion; my result is unexpected. I strain to emancipate myself from the confines of the tangible world. It’s fascinating that He Neng was able to stick to his creative principals and artistic rules for decades, never showing any signs of second thoughts or doubts in his own work. This is, of course, very much appreciated by the audience, clearly displayed by the fact He Neng held over 100 exhibitions around his country and the rest of Asia, never failing to attract massive numbers of viewers to his shows. Combine that with the fact he was always consistent, artistically brilliant and conceptually original, and you will easily see why He Neng is considered by many to be one of the most esteemed Chinese contemporary artists in recent history. Thanks to He Neng’s life work, both himself and Yunnan Art School will surely be held in high regard for years to come. He Neng lives and works in Yunnan, China.